Tough sinus and allergy symptoms come during both the cough-cold and allergy seasons. Be prepared to take these symptoms head on with Advil® Allergy & Congestion Relief. The ibuprofen in Advil® combined with an antihistamine and a decongestant to create a product that is well suited to relieve upper respiratory symptoms associated with allergies. 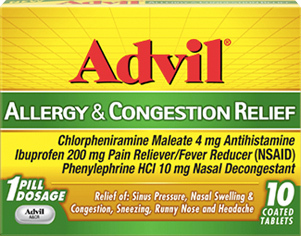 Advil® Allergy & Congestion Relief treats your multi-symptom sinus and allergy needs with one pill by combining Advil® and a proven decongestant to reduce swelling due to nasal inflammation, plus an effective antihistamine to relieve sneezing and runny nose, symptoms associated with allergies. directions for use take 1 tablet every 4 to hours as needed. Not for children under 12 years of age. I was SO happy to be chosen for this mission from Smiley360. This time of year everyone in my home is hacking and coughing due to allergies. I let my older brother try these cuz he was the worst of all of us and had a major sinus headache. He tried them and within a few hours of taking the first tablet he was feeling better that he was almost back to his normal self.. Within days he was having no allergy signs! We are will be picking up some more on our next drug store trip. disclosure~ i received a sample of Advil Allergy & Congestion Relief fro Smiley360 in order to write my review.